I need to keep moving on ESCALTAION and the MS is moving right along! So I'll keep today's post short and sweet. NaNo: As crazy as this sounds, as I'm trying to wrap up ESCALATION, I'm going to join NaNo for November and write a book I have outlined three years ago. This is a psychological thriller ala Stephen King from his early days. But forget these full length novels. This one will be a 175 page novella and I am not going to surpass that page number no matter what. But rest assured, this story is going to be real cool and very scary. And creepy. 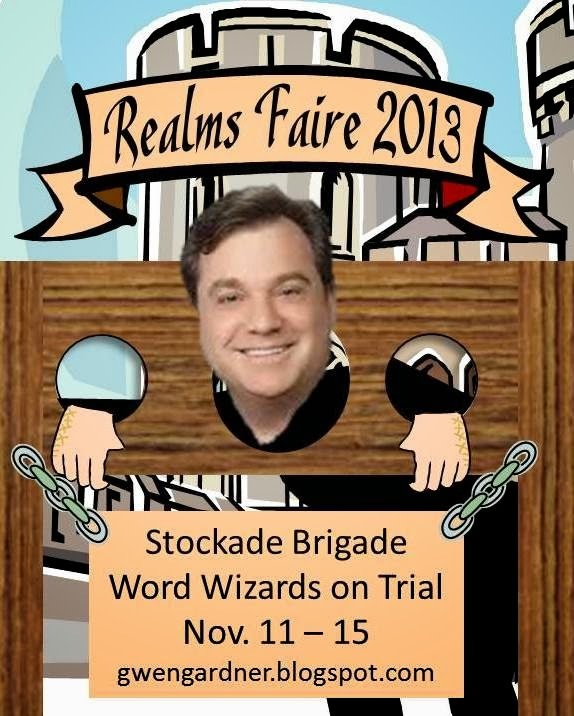 Realm's Faire Stockade: Okay, this is a short post. And you took the time to stop by. So I'll include a pic of me in stockades. 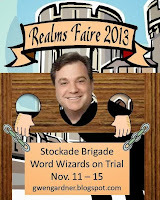 This is in preparation for Gwen Gardner's Realm's Faire Stockade, for better or worse. Why am I smiling? Can somebody please get me a glass of grog? Make it three. 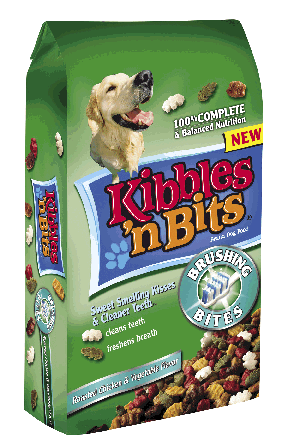 I think I'm going to need them. Oktoberfest isn't over yet. 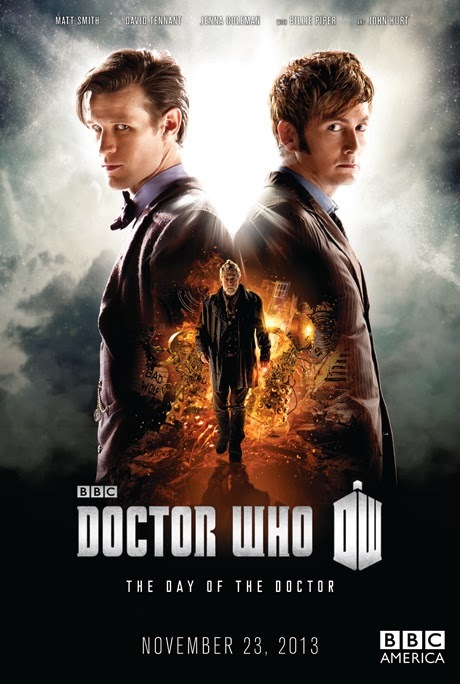 What To Watch: 'The Day of The Doctor' is the 50th anniversary special of the British sci-fi television program Doctor Who. 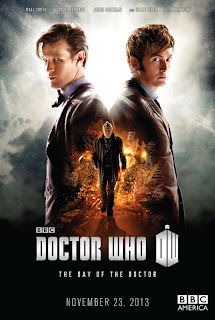 On Saturday, November 23, 2013, ‘The Day of The Doctor’ will be simulcast on television in over 75 countries including BBC America in the U.S., BBC One in the UK, and Space Channel in Canada. It will also be screened in cinemas in the U.S., Canada, U.K., Ireland, Germany, and Russia. Doctor Who fans all over the world are coming together on Saturday November 23rd to celebrate the 50th Anniversary of the show and watch the special episode ‘The Day of The Doctor.’ In addition to the Saturday screenings, there will be a special screening event Monday, November 25, 2013 showing The Day of The Doctor in over 300 theaters across the U.S. 'The Day of The Doctor' will also be available online on Sunday, November 24, 2013. Check out more details by CLICKING HERE. Have you seen the Dr Who trailer!??!?!?! *tongue hanging out*!!! Can't wait!! p.s. GOOD LUCK with nano!! and good for you! I remember the first episode of Dr. Who on TV. who'd had thought it would be still going???? Hi Stephen .. good heavens - thanks for alerting me to the 23rd November .. I might even watch. I sort of waft in and out of the Doctor series ... but the press build ups are good .. Attacking NaNo? Go for it! Thought though photos of you guys in the stockades were funny. Three glasses of grog, coming up! November is going to be some month for you. My daughter would never let me miss Dr. Who. A novella a la Stephen King? Yay! I adore horror and something scary/creepy would be awesome. Wishing you the best for NaNo! Oh fun! Let us know if you succeed in keeping it to 175 pages! Good for you for participating in NaNo. I admire your ambition! Whoa. Wrapping up Escalation and diving right into NaNo. You're a better man than I am, Gunga Din. Good luck. Stephen! Oh my gosh- you're doing NaNo? Yay! Will you be my writing buddy? My NaNo name is Bevimus. I'll send you happy nano messages and cheer you on! That stockade picture it a hoot! Me me giggle. I'm odd man out on Dr. Who, having never been a fan of the series (there are so few of us left in the world, thankfully for you Who fans.) But hazah for all of you- live it up! You look great in the stockades. Yay for Dr. Who! Seriously, you're doing NaNo, too? You're a writing maniac. Hi Steve. That was a cool picture of you in the stockade. You look almost comfy. Good luck with NaNo! Sounds like you're a man with a plan - hope you nail that novella. Also going to give NaNo a go, for the first time! And thanks for the Doctor Who heads up - better watch the last 2 episodes from last series that have been on the tv planner for ever!